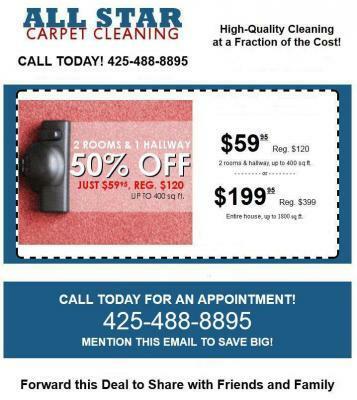 Why You Should Clean Your Carpet At Least Once A Year in Mill Creek, Wa.It is important to clean your carpet in your home at least once a year in Mill Creek, Wa. This will only increase your homes health condition. The idea of not cleaning your carpet at least once in a year will accumulate allergens greatly. For this reason, our truck mounted steam cleaning service is established to help customers, time and again. Using our truck mounted steam service once in a year will help to overcome the accumulation of allergens. If you have lots of allergies you may have to clean more often.Nevertheless, your home carpet will look much more attractive after using our cleaning service. There is no rival to the type of truck mounted cleaning service that we offer customers. On this note, you can always depend on our service for maximum result. Our carpet cleaning service remains the best to use in time of need. You can give us a call today.